Are the bears up yet? Hi ya-all, this is my first post here. 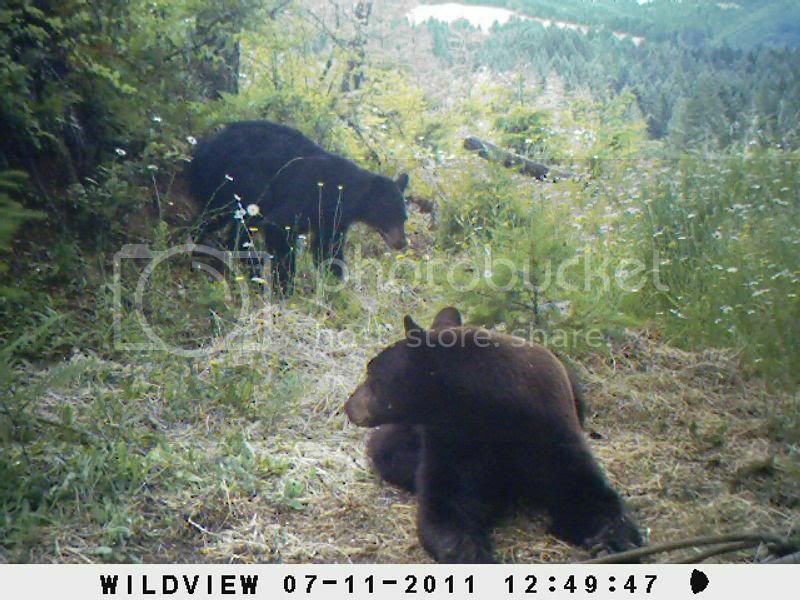 I'm wondering since we had a mild winter here in Oregon if the bears are up yet? Or if they did hibernate at all? 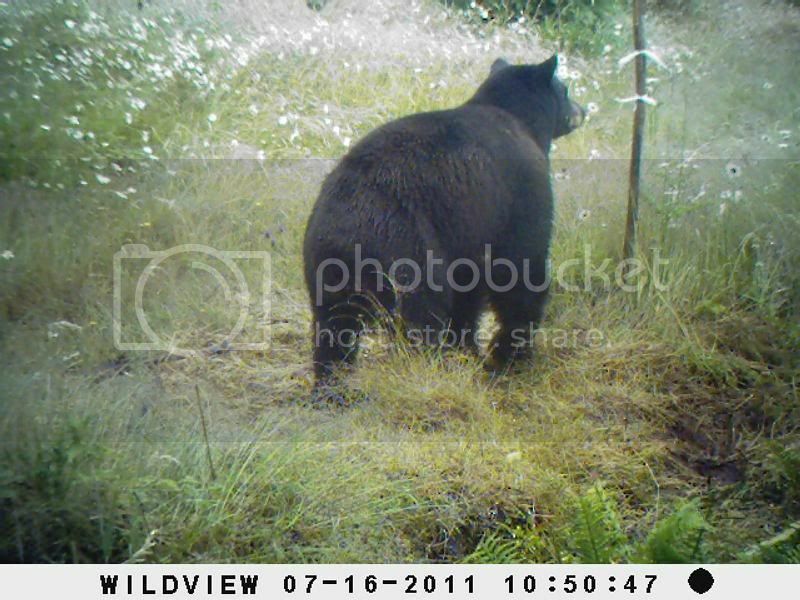 Last year in a few months, I got trail cam pics of at least 12 different bears in a drainage about 4 miles long, cams where less than 3 miles apart. The area is less than 10 miles from town, and the owners allow very few hunters, no one has posted any bear kill pics on any of the local hunter bragin posts. My son, grandson and I have permission to hunt the property, and of course to set up trail cams. Here's a few of our most wanted. 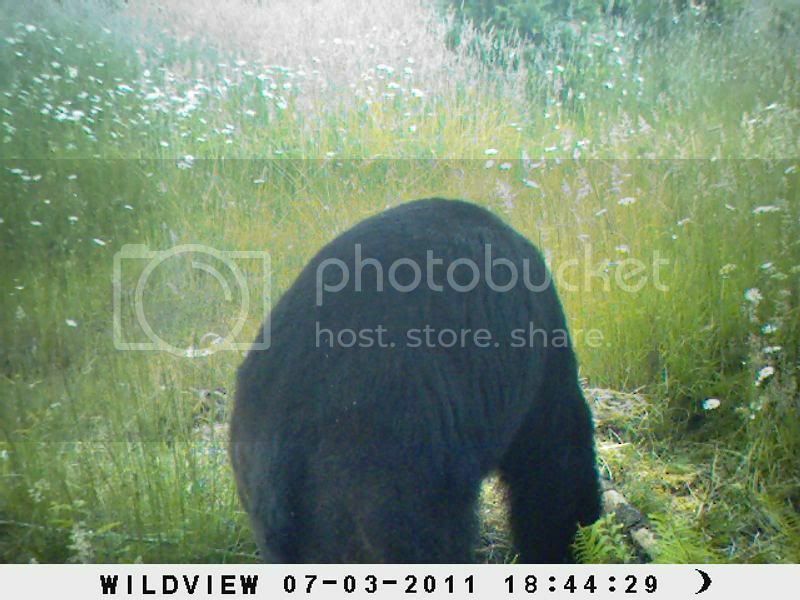 This pic was taken about 250 yds from the last house on the road leading into the drainage, ignore the date, just the default setting. 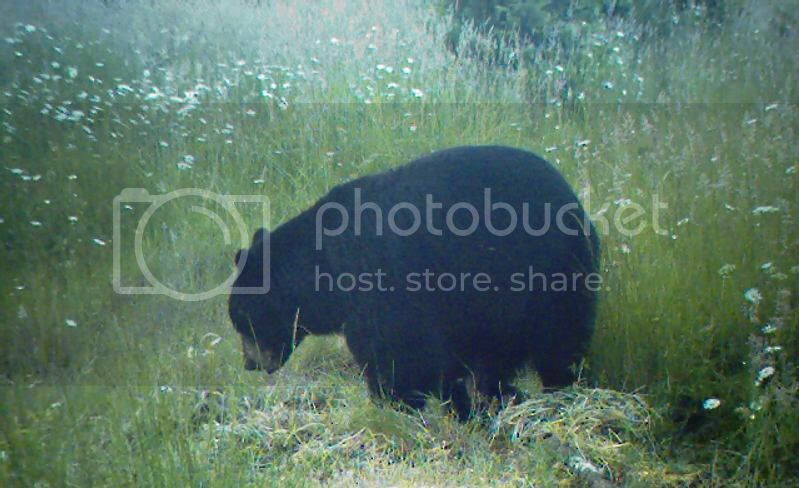 This next pic makes me wonder, since July is normally breeding season for local bears, was this a dinner date? Location, about a mile into the drainage. 'skin that one, and I'll get ya another!" Re: Are the bears up yet? The biggest bear showed up at an old homestead out in the middle of what is now timberland, there's an old apple tree there, along a natural travel corridor, and since its in Oregon, more specifically, southren end of the Willamette Valley, "the blackberry capitol of the US", there's plenty of blackberrys around the appletree. In fact, too many! No place to put a tree stand, tallest tree is the apple tree, and its only 25 feet, anyway, trail cam is mounted on the apple tree, and by mid July there where tunnels thru the blackberrys everywhere. 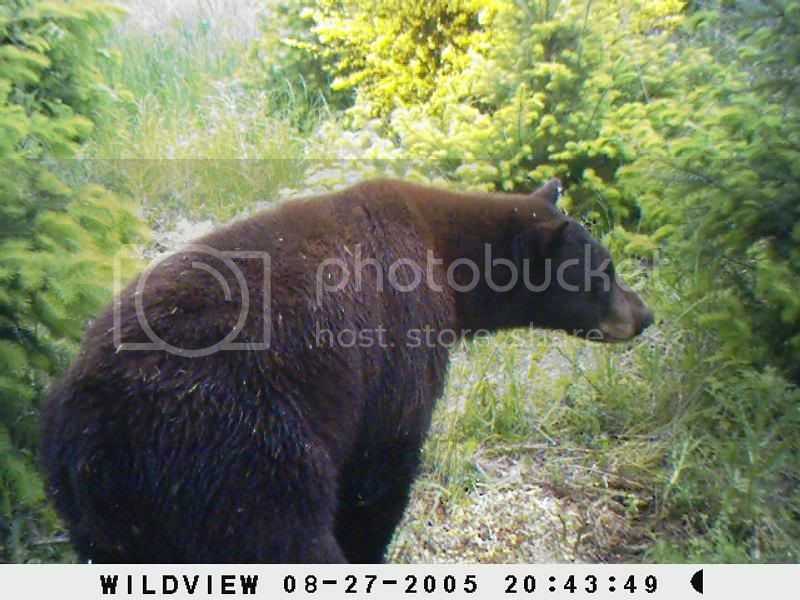 Note the lower white ribbon is 36 inches from the ground level the bear is on. If he keeps going in the direction he's now headed, about 30 yds from here, he'll be under an old tree stand, about 15 feet up an old rotting tree! Love this pic, its my screen saver! 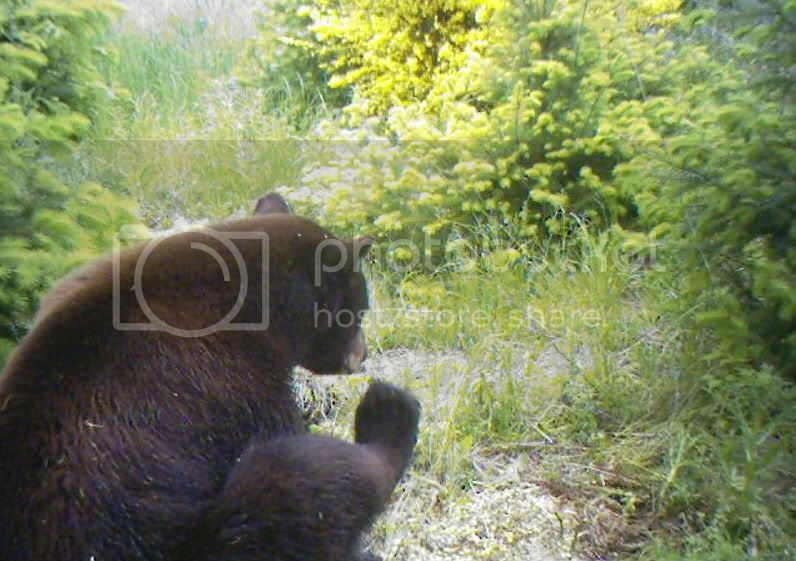 Great pictures, and nice bears. Life is about learning from your mistakes! Ive been after bears (spot and stalk) for years. I have yet to seal the deal. very nice! go get some!